Ashley arrived in Delhi late Friday night. I was so excited to see her after such a long time. The weather was hot and I was tired from a long hard week. 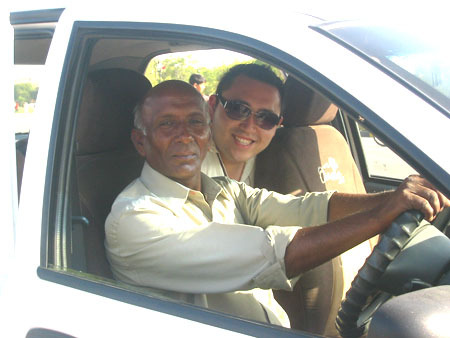 The rush of being with Ash in India for the next 9 days really kept me pumped as the Cab driver pulled into Gandhi International Airport. There are always so many people lined up waiting for visitors. The majority of people waiting there are private taxi drivers. Next time I go back I will be more prepared and get a picture of this very overwehlming sight. 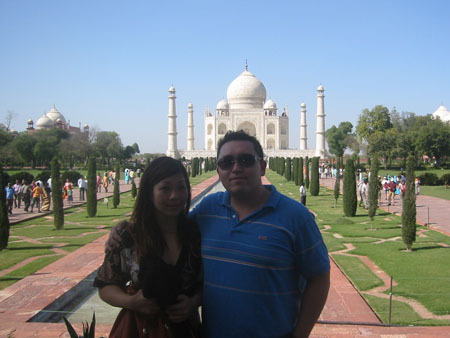 The next day after Ashley’s arrival was a drive to Agora to see The Taj Mahal. It was really impressive as I imagined. Even the picture I took don’t look real. The day was really hot as everyday at this time of season. Rampal our driver took us there. 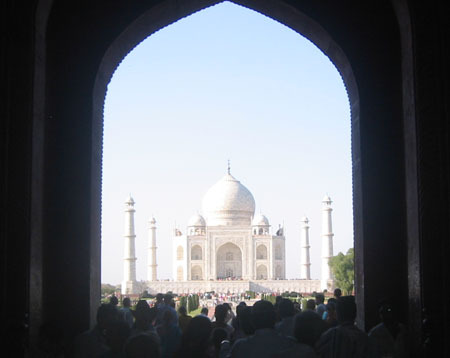 The entrance way to the Taj Mahal was a tourist trap of young kids claiming to be “the best guides and photographers you can ever find for a wonderful tour of the Taj Mahal”. one such guy latched onto us by the name os “Sunny” and he persisted to walk with us all the way to the Taj Mahal, giving us a rapid fire download of his knowledge. We finally got away from him and started the self guided relaxing non evasive tour. This picture is simply unreal. I love how the gate frames the tomb so nicely. The Taj Mahal gate creates a visual illusion in such a way that as you walk closer to the Taj Mahal the Taj seems to step back and as you get further it seems to come closer. 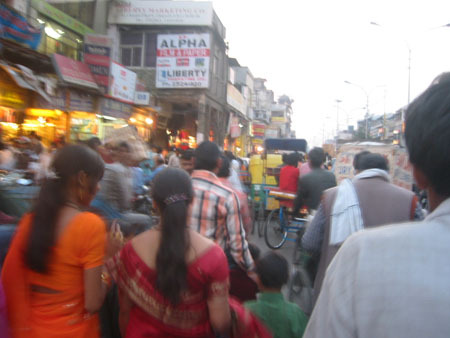 The day was crowded and you can see the long line of colorful clothing you see everywhere in India. Ok, so it’s a pretty high falutin title but it’s ture though not in the sense of Indiana Jones. These are a few pictures from my first two weeks in India. 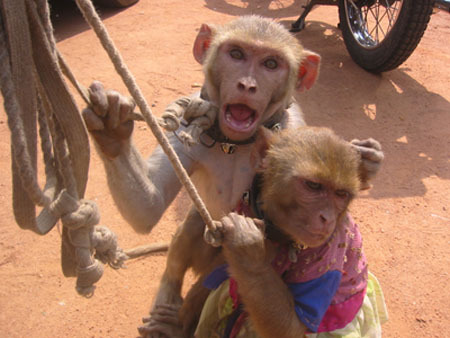 Saw these sad monkies near the India Gate in Delhi. The owner would beat them to make them dance and do tricks. He kept a horrible thick rope around their necks so that they wouldn’t run away. The often times tried to fight back biting him but it looked like he was pretty used to the complaints. So these Monkies are angry but they should be. 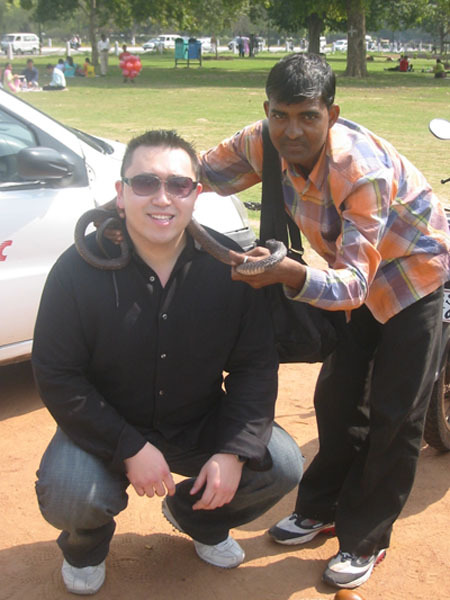 The same area of the monkies had a so called snake charmer with a medium sized black cobra. It’s venum pouches were taken away so it’s fangs were pretty useless. The snake rose and was more pissed at the owner than wanting to dance. It was still cool. The guy insisted on placing the angry snake around my neck. Humayan tomb was a really nice looking tomb. 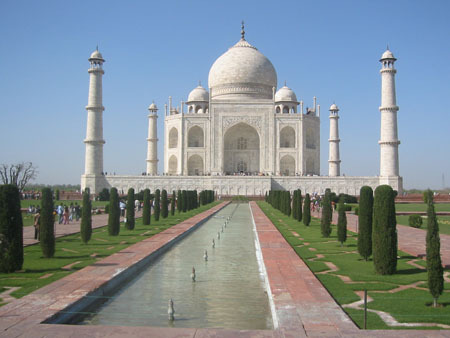 It was the inspiration for the Taj Mahal but used red marble instead of white. The scale of the tomb was huge as well, looming perhaps 7-8 stories high and a whole city block long. 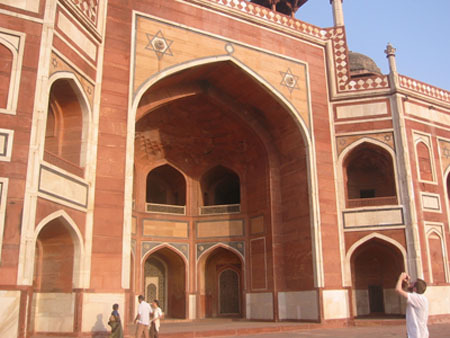 The entrance to the inner tomb is inscribed with arabic. The inside of the tomb boused the king, his two queens, and various cousins and close servants and even dogs. The next sight was a bit hard on the heart. 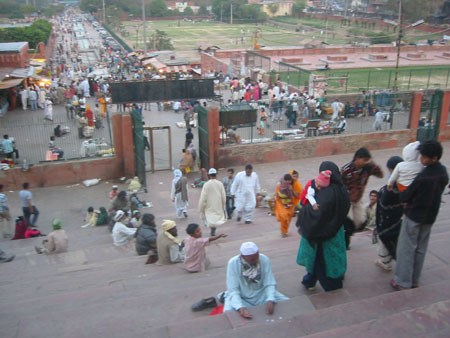 The big and very old muslim temple was lined with beggars, young and old. There were people that just could not move. They were so sad and all reached out their hands to people who passed in such sorrow, despair and weary that it was tough to watch. There was a little girl about the age of 6 or 7 who cared a naked baby about the age of 1. They were both dirty and kept pulling at our cloths for money. When we got on the rickshaw to leave, the girl and another one similar to her age ran after us. The sight of such a little girl so desperate, running barefoot with a big baby as big as her torso is still an image I’ll never forget. We next visited the old are of Delhi. You will see some picture in the previous post. The streets were literally packed tire to tire of rickshawas, bicycles and motorcycles, not to mention people, dogs, cows and the occasional three wheeller car, the tuk tuk. Food was all over the place, espcially in dark and dingy cornors. 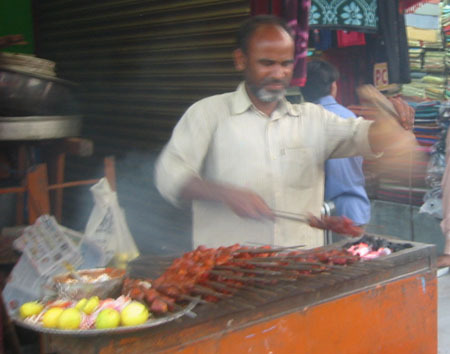 Delhi belly anyone? The below pciture is the outside of the Channey Cwok area at dusk. I really like the atmosphere in this picture. 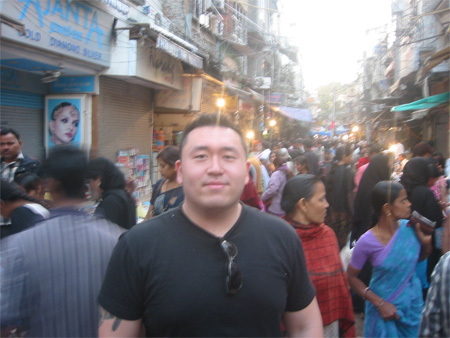 Ray’s First Day in India! I arrived in New Delhi Airport evening of March 3rd. Immediately upon setting foot off the plane, the smell was the first thing to hit. It was the same smell that I smelled in China. Too many people, dust, burning, pollution. A smell I will never forget but surprisingly a smell that you get used to. The airport was not very busy but upon exiting there were a huge number of livery services lined up with a name on a piece of cardboard. It was quite overwhelming but I found my name eventually and was brought to the Sterling Residency.Â A four floor corporate apartment.Â The room had AC, a cable TV, queen size bed (two doubles put together) and the best service you find. 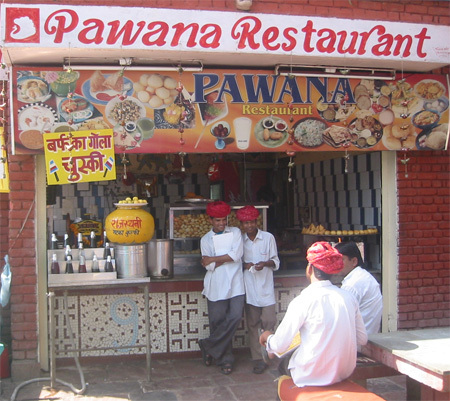 :)Â The staff was really friendly and like many in India who are in the service side of business, very humble and so quick to serve.Â It’s a bit uncomfortable coming from the States but hey can’t complain too much beyond that. 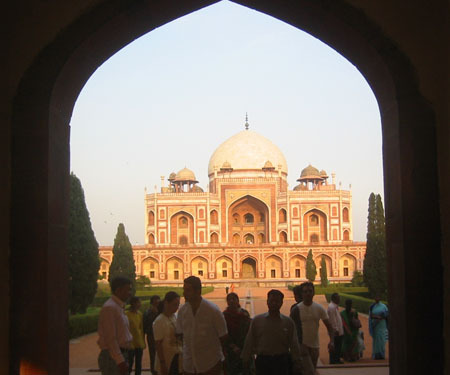 The pictures I have below are from my first full day in Delhi, visiting both old and new parts. 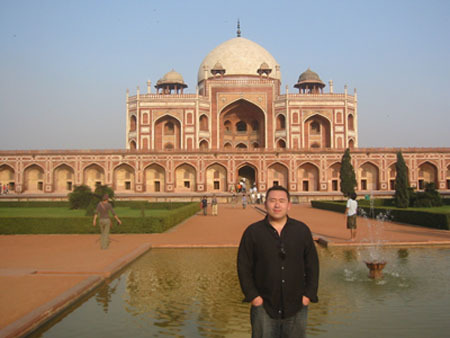 I went with two co-workers from Sapient, Dan and Chad, both whom have been to India before but really seeing Delhi as well for the first time. Some first impressions: Noisey, dusty, crowded and altogther crazy but interesting as hell. 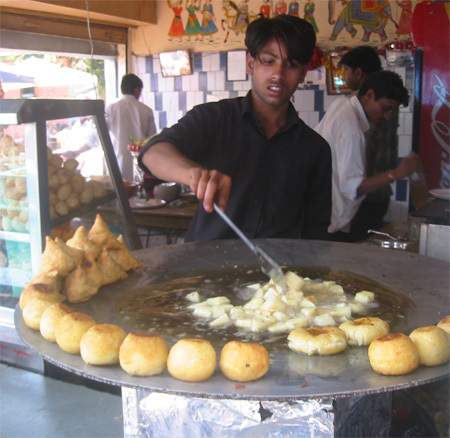 A Chaat Restaurant selling fried aloo (potatoes) covered with all sorts of spices, yogurt and stuff I really can’t put a name to. This was in a private market called Delhi Haat. 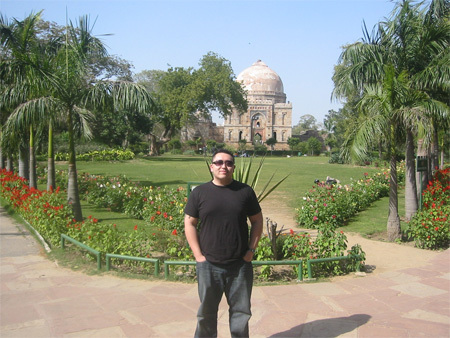 Lodi Gardens in new Delhi. A really beautiful public park with ancient Muslim tombs. 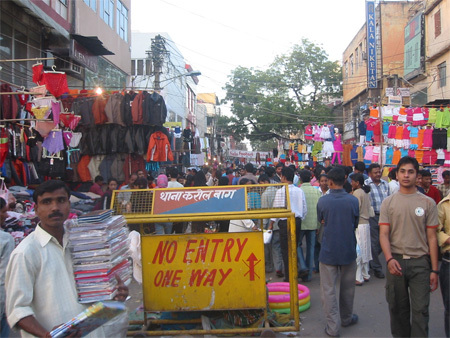 Karl Baugh, a outdoor market of inexpensive goods. The market is packed with shoppers and merchants each competing with each other selling almost the same types of stuff as their neighbor. 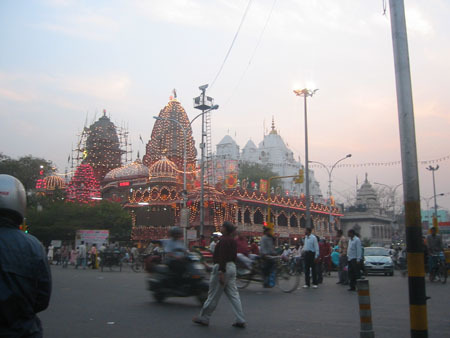 This area of “Old Delhi” is called Chaney Chowk, the oldest part i think of Delhi. 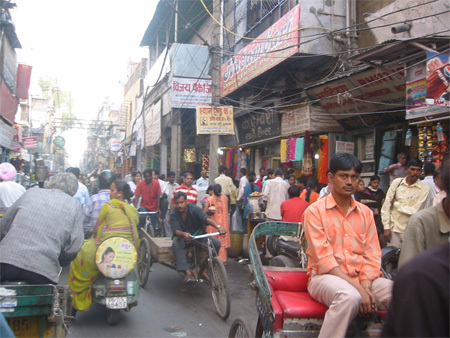 Rickshaws, people, dogs, cows and shops all jammed packed in a old part of the Delhi. This place was truely eye opening and will post more pics later.